We got up super early to take Elijah to the airport, then went back to sleep. It made for kind of a weird day and I’m thankful for the extra hour of light at this end of it. I never quite understand Daylight Savings Time and I know I’ll be grumbling when it’s pitch dark in the morning. One of the main things on my agenda for today was my weekly gift. You would think that giving away money would be a piece of cake, but really it is quite demanding. Some days I hardly feel up to the task. I thought it would go smoothly today and I set off on my errands with an optimistic swagger. Gradually, as I passed by person after person, I realized it would not be so easy. The stores were crowded, which always complicates things. I need a little zone of privacy in which to approach people. I made it all the way through my shopping as well as a visit to Jiffy Lube with the hundred still in my pocket. In something akin to desperation, I decided to stop for a cup of coffee at Peet’s on Broadway. As I was getting out of the car, a woman appeared at my side. Slightly (but just slightly) disheveled, she asked if there was any way I could help her out. “I’m homeless and I’m trying to get the bus to Milwaukie.” I looked her in the eye, boldly sizing her up. How had she ended up here on Broadway? She said she stayed nearby last night and had a place to stay in Milwaukie for tonight. She said her name was Claudia. I kept my eyes fixed on hers and she met my gaze without reticence. The doctor in me took in her face, her hands, the rash on her wrist. There was nothing obvious but something didn’t feel quite right. I pictured the bills in my wallet: a bunch of twenties. “Can I buy you a cup of coffee?” I asked, largely as an excuse to get some change. “No, thank you. But I appreciate it,” she said. I took my wallet from my purse under her watchful stare and pulled out one of the twenties. “Here, this should help a bit.” She thanked me with a hint at a smile. “Be careful out there,” I warned. “Thanks, I will,” she said, holding my gaze for a long time. The whole encounter shook me up a bit. Had I given enough? Too much? Would I ever get it right? Why do I care so much? I went inside and ordered my coffee. It started to rain and I wished I had dressed more warmly. As I was waiting, a man came in and approached the counter. “Your usual?” asked the barista. “Please,” the guy answered. 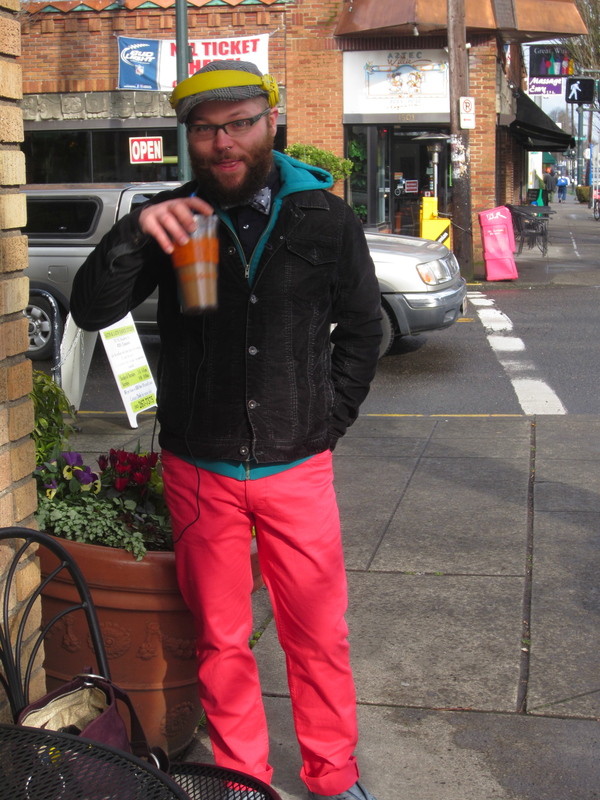 He was like a ray of sunshine: bright pink pants, yellow headphones, very cool shoes and a saucy bow tie. I tried to listen in on the conversation he was having with the barista but caught only snippets. Something about an event they were both going to. Maybe. We both had our drinks and were heading out the door at the same time. “I like your tie,” I commented. “Bow ties are…” “Under appreciated?” he offered. “Yes! Under-appreciated and under-worn!” He said he agreed and that he likes wearing them for that reason. “I have a ton of bow ties,” he told me. I knew I wouldn’t be able to help myself and, sure enough, found myself sharing how my father wore only bow ties. And how embarrassing this was to me as a young person. It’s all in this post here. By now the man and I were standing outside. The rain had stopped for the moment. “Now I understand he just was trying to be himself. You know, make a statement,” I said. He said he understood completely, and how all each of us can do is be ourselves. Then I told him I had something for him. He looked skeptical while I explained briefly about honoring my mom by passing along a gift she gave me. I grabbed the bill from my pocket and gave it to him. That man just exuded sweetness. I’m so glad he’s doing well enough to be a regular at Peet’s. And to think about Italian shoes. How lucky am I, with hundred dollar bills to spare? It’s almost 7 PM and still light out. I see Claudia’s tired face when I close my eyes. 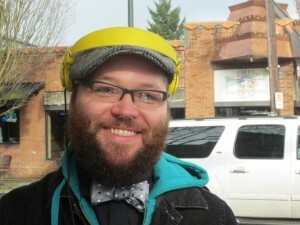 I am a barista off 4th and Morrison at Starbucks and have had the pleasure of knowing Kyle as one of our regulars since we opened in August. Almost directly after this happened, cute little happy-go-lucky Kyle came into our store and would not stop gushing about how this experience touched him. He told us about the blog and your personal journey; naturally I had to check it out. I must say, even though we’re in thick of Portland grey, I am impressed at your ability to turn your pain into joy and touch those around you. It’s inspiring to see that happen these days. 😀 I hope you are comforted by the smiles you are creating.